I want to become an independent agent. Independent agents form part of the Cape Cookies’ family. As a family member, an independent agent is able to enjoy benefits such as being able to purchase our delectable products and sell them to friends, family and work colleagues. Not only are agents entitled to free delivery and volume discount benefits, they are also able to apply for credit. How does this empower people? Just like a family, the Cape Cookies team provides independent agents with a unique support structure. This allows them to venture out and create their own business, thus earning extra income and reaching their full potential. By creating jobs and shaping the minds of those who wish to journey into an entrepreneurial field, we are baking a difference as well as adding value to and empowering the previously disadvantaged and youth of South Africa. 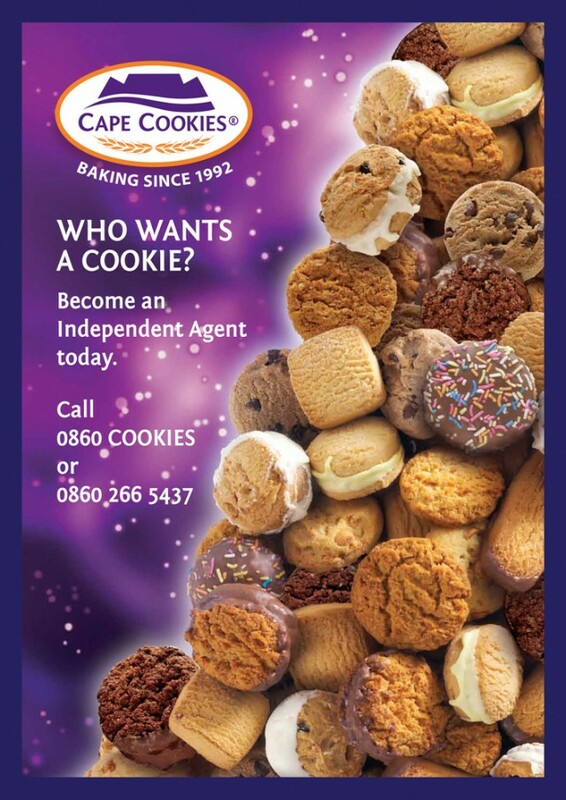 How can I become a Cape Cookies’ independent agent? Please contact our call centre on 0860 COOKIES (0860 266 5437). Please note that this is a share call number, i.e. local Telkom rates will be paid from any part of South Africa. Alternatively, ‘Submit’ your details on the left and one of our Sales consultants will get back to you within 24 – 48 business hours.